I parked the car at the Boat Lauch off of 7 Lakes Drive off, and headed up the 7 Hills Trail which begins right here. 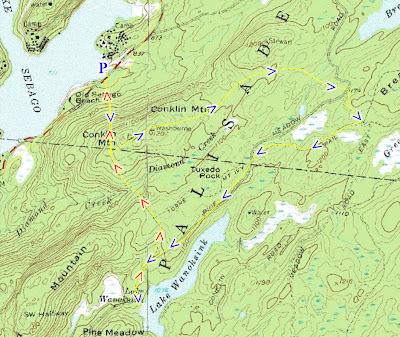 Climbed up Conklin Mountain on the 7 Hills, and then at the intersection with the Buck Trail continued along the ridge of Conklin Mountain. Although this mountain is relatively high in regards to its surrounding, there are suprisingly no views from its summit or ridge. The Buck Trail is unique in that it has two spurs near the end, with different blazes to identify each spur. 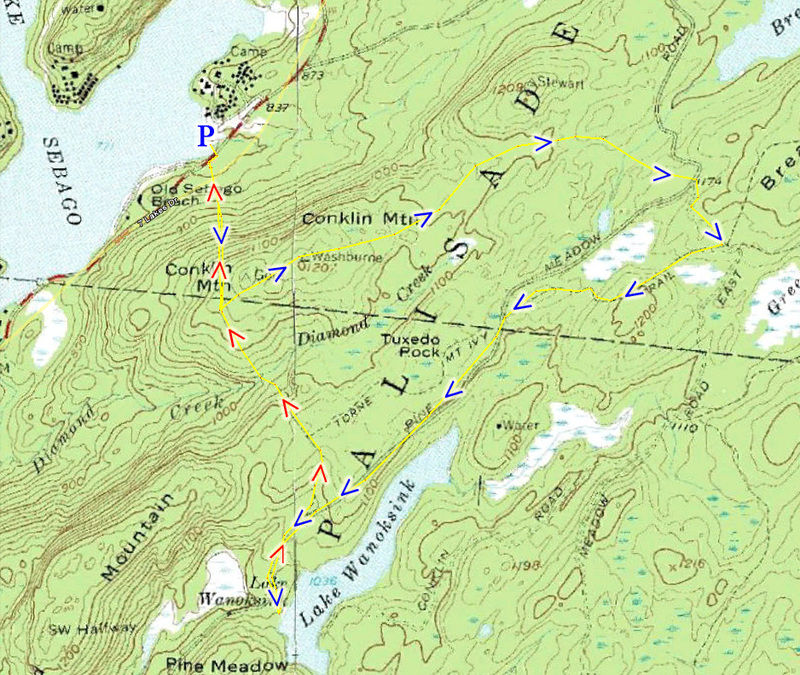 I took the plain yellow spur (in contrast to the yellow/black blazed spur), which ends at Pine Meadow Road, which is a wide footpath used by hikers and cross-country skiers. From there I took the T-MI Trail around the swamp and back towards Pine Meadow Road. I then took Pine Meadow Road south towards the southern end of Lake Wanoksink, where I took some pictures and then headed back and veered off towards the unmarked spur which leads to Monitor Rock and the 7 Hills Trail, and then took this back to my car. At the end at the Lake Sebago Boat Launch I took some good photographs of the lake. Lake Wanoksink at its southern end. Looking North. Looking south at Lake Wanoksink. Note how crystal-clear the water is. Another view of Lake Wanoksink, facing northeast. Taken from Boat Launch facing southwest. Close-up of canoe on Lake Sebago. Facing east across the lake. Do you know if there are any nice campsites on a shore of Lake Wanoksink? The only public camping area in the park is the Beaver Pond Campground near Lake Welch. Other then that, camping overnight in a tent is only allowed in the designated park shelter areas. The closest shelters are at the Stone Memorial on the S-BM Trail and the Sherwood Path, and at the Dutch Doctor Shelter on the other side of Lake Sebago. Unfortunately there are no camping areas by Lake Wanoksink. Thanks for your reply. I'm familiar with official rules, but I know that people stay overnight at places that are not designated as such. I meant if you know if there are any nice spots on the bank of the lake to set up a tent or two. Preferably something that is more secluded than Pine Meadow Lake. Thank you. The park rule of not camping except in the designated areas is established so that people don't cut down trees or disturb the plants to create a place to pitch the tent or make a fire. Also the park doesn't want to deal with open fires outside designated areas. I won't sanction breaking these rules, especially in a public forum like this, but if you pitch a tent somewhere remote I don't think anyone will stop you. Lake Wanoksink is definitely more remote then Pine Meadow Lake, but there are people that visit the area, especially on the Southwestern part on the way to Pine Meadow. Also if you are next to a lake with a tent you risk being seen from any vantage point on the lake. As far as lakes go, Wanoksink is definitely a more quiet one though. However, there is a shelter called the "Dutch Doctor" and its pretty close to Lake Sebago, so you may want to check that one out.